Our fine quality Episcopal Flags made from durable heavyweight nylon are made with precision and passion. These 100% made in the USA flags are made to the highest standards. Crafted of 200 Denier nylon and finished with heading and grommets, these flags are a perfect fit for churches and organizations that fly flags on a daily basis. Choose from a range of different sizes in outdoor and indoor flags including 3’x5’, 4’x6’ and 5’x8’ to celebrate the legacy of the Episcopal church and its teachings. Shop right away and get the advantage of the best prices, quick shipping and much more! 100% customer satisfaction guaranteed! Episcopal flags that originated in the United States date back to 1918. Color white represents the purity of the Christian religion while the red cross of Saint George, the patron saint of England, indicate the origin from the Church of England. The blue in the upper left-hand corner is the light blue of the sky while the nine white crosslets on the blue field represent the nine original dioceses of the Episcopal Church in America in 1789.Our Episcopal flags use Dupont Color-Fast dyes that can resist UV radiation, which makes it a good choice as a daily use flag. The flags that are reinforced with lock stitching are wind resistant and durable for outdoor weather conditions. 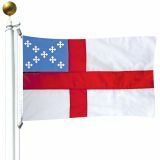 Looking for Episcopal Flags for your church or home? Shop at Tuff Flags and get the best prices and the widest selection. Call us our toll free number (888) 287-3524 or email at customercare@tuffflags.com for any further queries or assistance.